Welcome to Weaver Computerised Embroidery Systems. 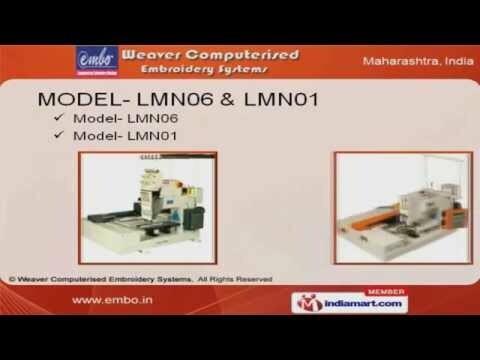 Manufacturer of Computerized Embroidery Machines. The company was incepted in 2000 in Pune. Our Strong market presence and well maintained supplychain help us to achieve a present repute in the market. Onsite staff training, impeccable quality and performance standards help us to achieve an unrivalledposition in the industry. MODEL PORTABLE T6 SR, Training and Embroidery Digitizing Services are some of our products andservices. We have been exceptionally able to offer our customers a range of MODEL LMN06 and LMN01. MODEL BDMN06 and BDMN01 are well known for their outstanding performance. We are known in the industry as the manufacturer of MODEL XMN06 and XMN01. Our Model Protable T6 SR is best in the industry amongst others. Along with that we offer Training and Digitizing Services that are a class apart.